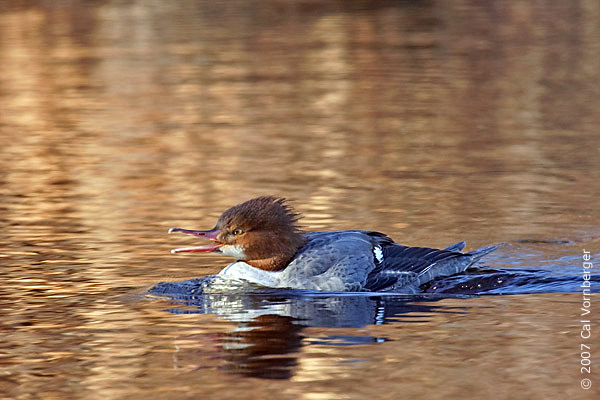 Common mergansers are an essential predator of aquatic ecosystems. They are actually considered to be top predators in the aquatic food chain feeding on many small fish. Common mergansers are built for obtaining and consuming fish. Their long, thin bodies make them excellent divers and swimmers. The becks of common mergansers contain saw-like teeth to help them capture prey. 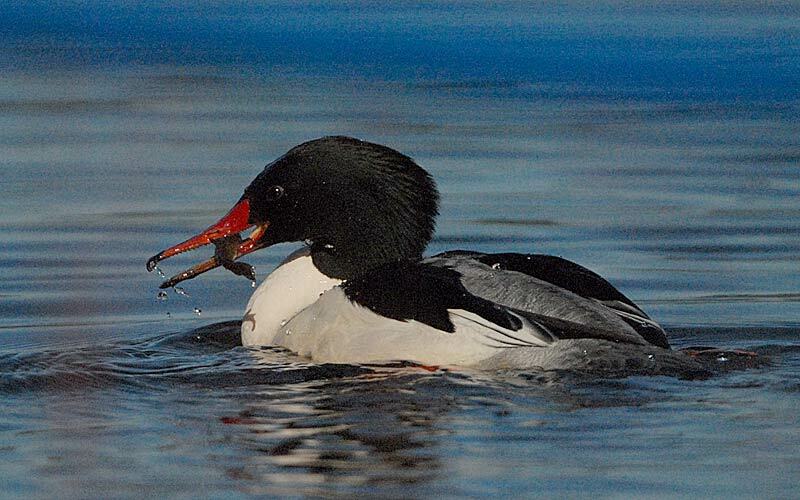 Common mergansers feed on a wide array of fish depending on the habitat of the birds. Some fish that common merganser feed upon include large mouth bass, perch, trout, and salmon. Fish are the primary food source for common mergansers however they will also feed on mollusks, crustaceans, insects, worms, frogs, and even small mammals and birds. They have also been known to feed on aquatic plants in some instances but these birds are mostly carnivorous. Common mergansers prefer clear water for feeding because they use sight as the main means of acquiring prey. One it comes to feeding, these birds are most active early morning after dawn, in the afternoon, and before dusk. Common mergansers are mostly carnivorous creatures. Carnivores tend to use more energy to acquire their food but the food it better quality. Common mergansers have a closed digestive tract which is used to break down and absorb nutrients. Food enters the mouth and moves down the esophagus to the stomach. It then travels down the small and large intestine and is excreted from the body. As food moves down the bird’s digestive tract, it is broken down and nutrients are absorbed into the blood stream. Common mergansers have a closed circulatory system which contains a four-chambered heart and two circuits. One circuit travels from the heart to the lungs and back. The other circuit travels from the heart to all over the body. There are many different benefits to having a closed circulatory system. One benefit is enough pressure to maintain a high flow rate. Another benefit is precise alteration of blood flow.